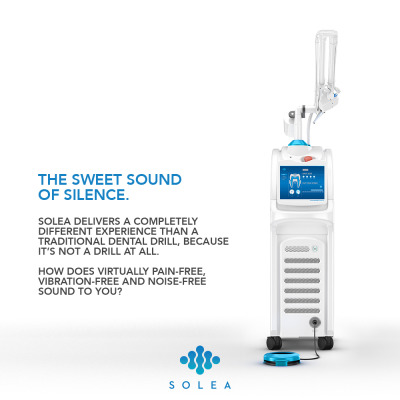 With Solea’s unique wavelength and computer controls, dentists can reliably perform procedures anesthesia-free, blood-free, suture-free and pain-free. 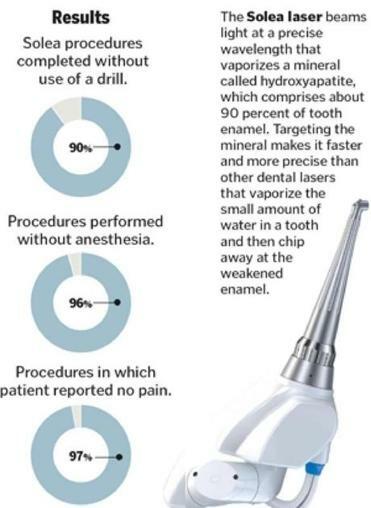 Solea is a dental laser that we use to replace the drill for cavities and the scalpel for gum surgery. With Solea we don’t have to give you a novocaine shot for the majority of procedures. The appointment is faster because we don’t have to wait for you or your child to be numb. Since we don't administer novocaine for the majority of procedures, you won't leave with a numb lip after the procedure, so you can eat and drink right after your appointment. We can also do multiple procedures in one appointment because when we don’t have to use novocaine, we can work in different areas of your mouth. Solea Laser is great for kids! It’s faster, for most procedures they don’t need a shot and we don’t have to use the drill for cavities or scalpel for gum surgery. Plus, they won't have a numb lip, so they can eat and drink right after their appointment. The majority of procedures can be done with Solea - from cavities to oral surgery, with the exception of root canals and endo. For the majority of procedures Solea is pain-free, some patients tell us that they feel cold air, but no pain. Yes, it is. Solea procedures are covered the same way traditional procedures would be covered. Solea is a new technology we're using that’s replacing the drill, so billing codes are the same. Yes, it’s actually better for you since we don’t have to inject with you anesthetic for the majority of procedures. Cleared by the Food and Drug Administration (FDA) as the first CO2 dental laser to treat teeth and gums. Solea is changing what it means to go to the dentist- one appointment at a time.